snowdeal.org > ex machina: natural allies. 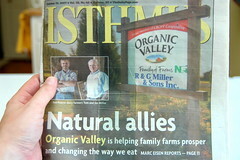 there are more than a few articles written about organic valley each month, but a recent write-up by a small madison, wisconsin-based paper, "isthmus" is one of my favorites. take a few minutes to read "natural allies" and you'll get a glimpse into why it's pleasure and a priviledge to work for the cooperative. sometimes it's a bit daunting to attempt to predict future demand for a perishable product in a market that's growing at a stupendous rate but it's quite satisfying to know that you're helping family farmers survive and thrive. as an added bonus i get to work with some of nicest people you'll ever meet ( profiled in the article ). "In 2006, Organic Valley's sales jumped 38%; they are expected to hit $430 million this year and to pass a half-billion dollars in 2008. Not bad for a co-op that was formed in 1988 by a tiny group of struggling small farmers and back-to-the earth idealists in the picturesque Coulee Region of Wisconsin." ""Is it our goal to be a billion dollars? No, it's not," [Louise Hemstead, the chief operating officer] says. "We measure our goals by two numbers: Are we paying a sustainable 'pay price' to our members and how many farmers are we servicing? Those are the goals we're managing to. Not what the total dollar sales are.""